The only thing more bizarre than the demands of the residents make of the public services office building are the civil servants working there in this manga that inspired the anime! Lucy (etc.) Yamagami has just started work at the local public services office, but she’s found that work as a civil servant is a little bit wackier than she expected. Putting up with the world’s most effective slacker, a cosplay maniac, and a public service obsessed high-schooler, Lucy is already up to her neck just dealing with her co-workers before even getting to her work serving the local demanding residents. In fact, Lucy is a little bit clueless herself, and together her wacky gang of civil servants go through each day dutifully serving the taxpayers in this 4-koma comedy. Servant X Service will be of interest to fans of 4-koma gag manga, as well as those interested in slice-of-life comedy. I’d hazard to guess that the local civil services office is somewhere many of us dearly try to avoid, but Servant X Service uses this setting effectively to ground its slice-of-life comedic trappings. This is a 4-koma style gag-manga at its core, but I found Servant X Service to be significantly more subdued in nature compared to the highwire antics of some of its compatriots in the genre. It isn’t quite a punchy as other series, but this felt strangely appropriate given the humour comes at the expense of the recognized blandness of working at a municipal office, and I grew to enjoy the slice-of-life take on the subtly wacky lives of these workers. Interestingly, the humour comes more from bouncing these odd characters off their rote surroundings rather than off wacky set-pieces, and this worked well the volume progressed. The pacing is unmistakably on the slower side, but the volume settles into a comforting rhythm as it progresses and as we get to know the characters. 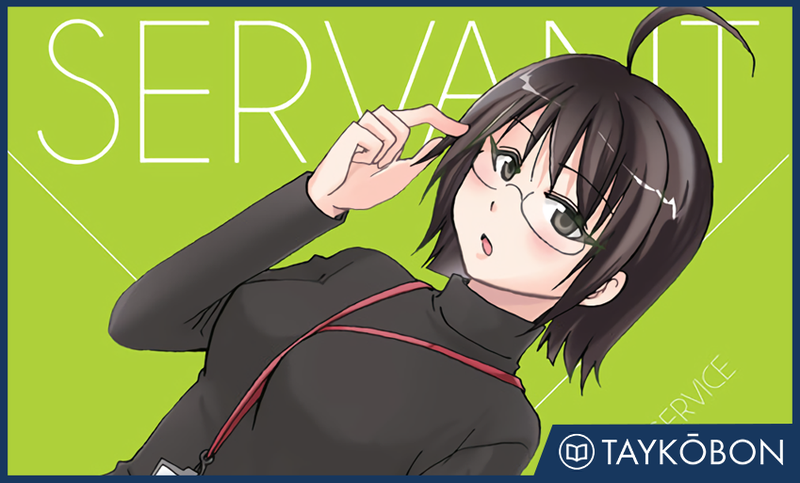 Although Servant X Service settles into a constant rhythm as a comedic slice of life series, there isn’t a whole lot of overarching story to be found here. Again, this almost feels appropriate given the everlasting tedium destined to be experienced by these characters at their job, and as a result I actually didn’t have too much of a problem with this even if it didn’t make for exceptional reading. However, I did enjoy the smaller mini-arcs followed such as intern Chihaya’s cosplay obsession as well as high-schooler Touko’s insane demands for the way they fleshed out this cast of characters. This wasn’t quite enough to keep me entirely engaged because of how subtle it all was, but I liked the way that arcs would frequently be built upon later in the volume to create more of a character-based gag manga that had me chuckling from time to time. Servant X Service makes its trade on bouncing its characters off of the daily tedium of civil service work, and thankfully the characters here work fairly well for this purpose. From the overly serious yet naive Lucy (etc.) to their occasionally despondent stuff-animal of a boss, all of the characters complemented each other well for the purposes of setting up some subtly humourous situations. My personal favourite was the office’s amazingly proficient resident slacker Hasebe because of the way he would frequently steal scenes thanks to his unabashed creativity at being lazy, and I generally liked the rest of the characters. One thing I noticed is that the characters generally felt tropey in the sense that I felt at times that they were a combination of frequently employed archetypes. However, Servant X Service accomplished the act of subtly bouncing these characters off each other well, and seeing the cast in action was my main source of enjoyment in this volume. Servant X Service’s art is on the blander side much like the jobs of its characters, but it generally worked well enough for the purposes of this series. I would have liked if the characters were a little more distinctly drawn because I noticed I would frequently mix up several similar looking pairs of characters early on. However, I felt that the art did a good job portraying the facial expression of these characters in a way that was recognizable and suited the various situations effectively. Additionally, the series felt a little bit constrained by the 4-koma style, and a few of the panels felt cramped because of how small they were. Servant X Service is a largely average gag-comedy that does a good job keeping things going by playing its characters off of their bland everyday jobs. I definitely chuckled at times, but there weren’t any moments that absolutely got me in a way that made me want to keep flipping pages. This is a series that is definitely meant for people who are sure they want a slice-of-life series and will satisfy those devoted, but others looking for a little more bang to their comedy will probably be left wanting. Servant X Service Vol. 1 (comprising volumes 1 and 2 of the Japanese release) was translated by Amanda Haley and was released physically in English by Yen Press on April 26th, 2016. Authored by Karino Takatsu, the series run in Square Enix’s Big Gangan magazine. The second volume is scheduled for release in English on June 28th, 2016.